Pumpkin puree is one of the easiest things to make from scratch. You can replace your canned pumpkin with pumpkins fresh from your garden, and it hardly takes any effort at all. 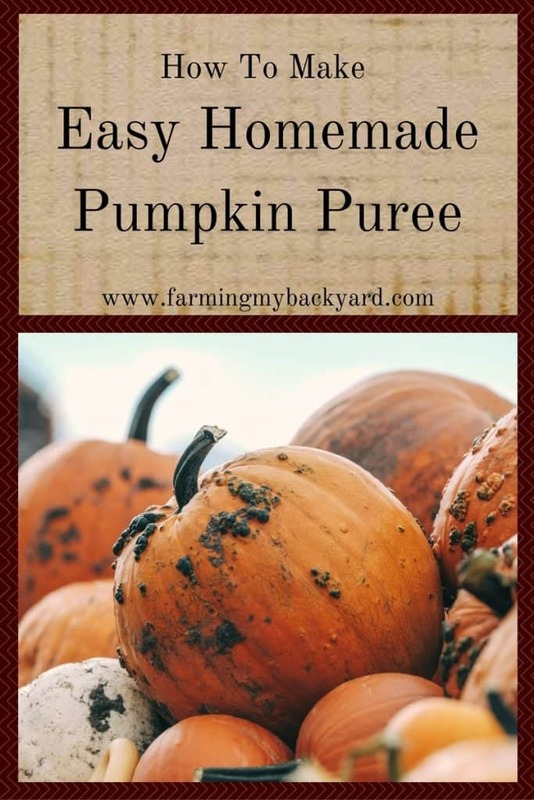 The best kind of pumpkins are sugar or pie pumpkins, so buy or grow those if you want a nice smooth puree. Carving pumpkins are stringy and not as yummy. I’ve attempted to grow pumpkins in the garden for about three years straight now, and I always start them too late. Last year I actually got one tiny little pumpkin and we roasted it, but I also do this with pumpkins from the store, or even homegrown butternut, acorn, or spaghetti squash. If you don’t have any pumpkin and you are in dire need of a pumpkin pie butternut squash makes an awesome substitute, and you cook it exactly the same way. 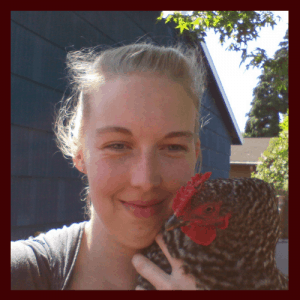 You can compost the skin, or feed it to the chickens as a natural dewormer. The seeds can also be fed to the chickens, or roasted for the humans. This makes great, muffins, pies, cheesecake, bread, smoothies, or anything pumpkin flavored that uses pumpkin puree. Last Christmas we made a pumpkin cake with awesome cream cheese frosting. As a general rule, cream cheese frosting makes everything even more awesome. But there are just SO MANY ways to use it. My all time favorite way to use pumpkin puree is in this pumpkin cashew dairy free cheesecake. What’s your favorite pumpkin-y food? I bet the pumpkin pie made with fresh pumpkin puree is fantastic! I have to try doing that this year. I would be amazing, and I am sure the kids would love some pumpkin pie! It is pretty awesome! You just have to make sure to puree it until it’s really smooth.